In 2000, the Florida ballots of overseas service members were a key point of controversy in the Bush vs. Gore election. Now, 16 years later, little has changed for most overseas troops, who still have to vote absentee mostly through international mail. Florida lawmakers did create a task force this year to study developing an online voting system for military and overseas voters. But task for members aren’t expected to meet until after the 2016 November election. However, a handful of other states are experimenting with more modern electronic ballot return. If you’re active duty military on base, aboard ship or in a combat zone, absentee voting can be a complex process because each state has its own regulations. So, the Department of Defense created the Federal Voting Assistance Program (FVAP) to simplify access. 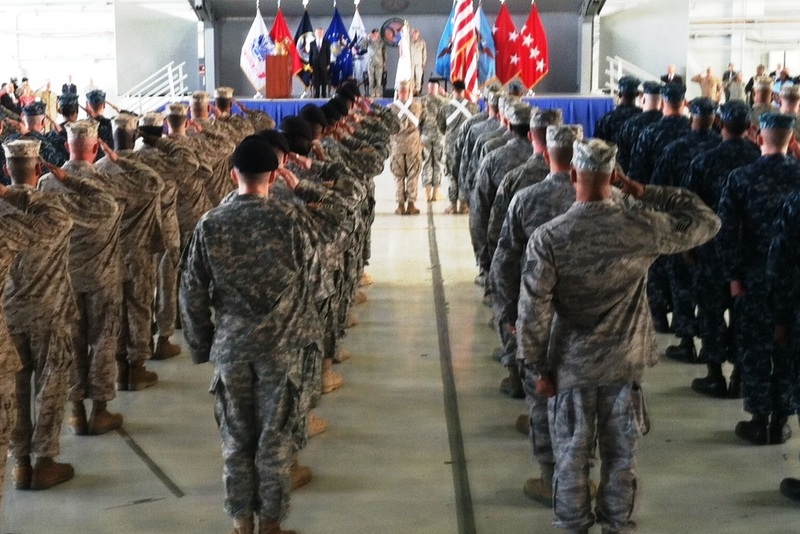 But director Matt Boehmer said many service members remain frustrated with the process. All states are required to provide overseas voters an electronic ballot. All 50 do so by email and online. Most offer faxed ballots and paper ballots can still be requested. But returning a voted absentee overseas ballot is where it gets tricky. Eighteen states require ballots to be returned only through the mail. The other 32 allow some form of electronic return but it varies widely. For instance, Florida accepts overseas ballots only by mail or fax. Echeverri served in Afghanistan from 2003 to 2004 and is Florida director for the advocacy group, Concerned Veterans for America (CV4A). Dan Caldwell, CV4A vice president of communications and policy, is an Iraq War veteran. He said their generation expects the ease of electronic voting. But it’s not just bureaucrats; state lawmakers decide their states’ election rules. And it’s a balancing act between giving voters the convenience of online access versus protecting the integrity of their ballot. Four states do provide online voting to limited groups like military personnel in combat zones. Alaska is the first state to allow everyone to vote online. Yet, Underhill says the Alaska process is not all that simple. “Not only do they cast their ballot online, they have to printout a voter identification certificate and something else and get it signed by themselves and a couple of witnesses. And then, scan that back in and send it too. And so it’s not that it’s an easy process,” Underhill said. Looking at the bigger picture, 56 percent of active duty military, in the 2014 FVAP survey, said the process to get an absentee ballot was too complicated and confusing. Either a group or an individual claiming to be a part of the Islamic State (ISIS), hacked two social media accounts belonging to US Central Command, which oversees Department of Defense operations in Iraq, Afghanistan, Syria, and the rest of the Middle East, North Africa, and Central Asia, according to Politico. The first tweet following the hack read, “AMERICAN SOLDIERS, WE ARE COMING, WATCH YOUR BACK. ISIS,” and linked to a longer statement threatening American soldiers and their families. The hackers also targeted Centcom’s YouTube page, posting ISIS propaganda videos. The attacks happened earlier in the day as President Barack Obama was emphasizing the importance of cyber security to keep citizens safe from identity theft. As of 1:15 p.m., Politico reports that Twitter has suspended the CENTCOM account. The YouTube account also is suspended. 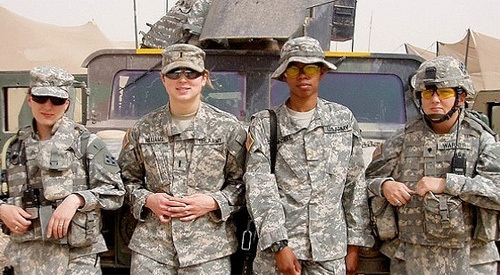 Female Veterans in Iraq. A New Resource for Female Vet on VA health care and benefits: 1-855-VA-WOMEN. What happens if you plan an event to honor women veterans and none of them come? That’s a real concern at the Disabled American Veterans Chapter 97 in Sarasota. The organization is planning a free event August 30th for the area’s women veterans, but so far, they’re having a tough time generating interest. The Honoring Women Veterans in Sarasota event is scheduled from 10 a.m. to 2 p.m. at the DAV Chapter building, 7177 Bee Ridge Road, Sarasota. Veteran women from the Sarasota region can register for the event and day care by calling 941-580-0999. The chapter’s treasurer, Iris Johnson, is part of that team. She said a church group offering free school supplies to children of women veterans had the same problem. 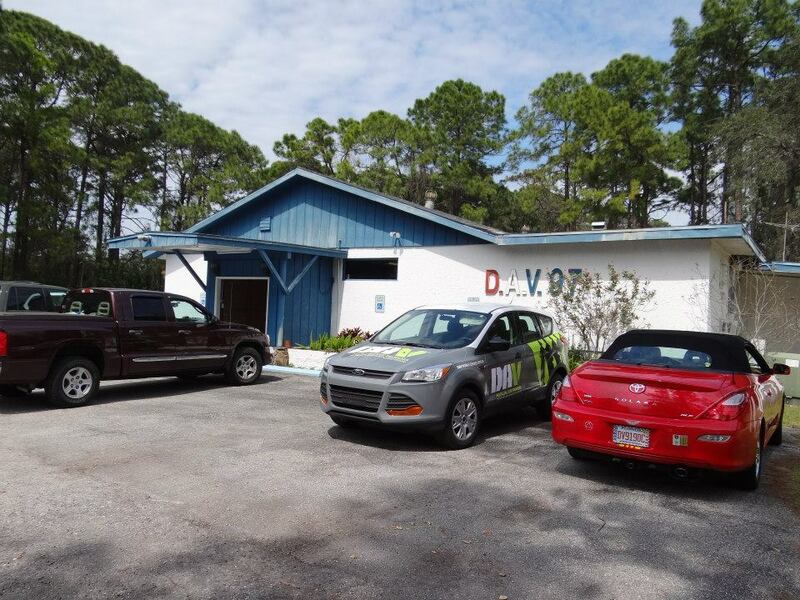 The Sarasota Disabled American Veterans Chapter 97 building on Bee Ridge Road. The chapter commander is adjusting to reach the younger, female veterans. They recently started a Facebook page and are learning about social media. Getting messages out to veterans is the job of Karen Collins, communications director at Tampa’s James A. Haley Veterans Hospital. 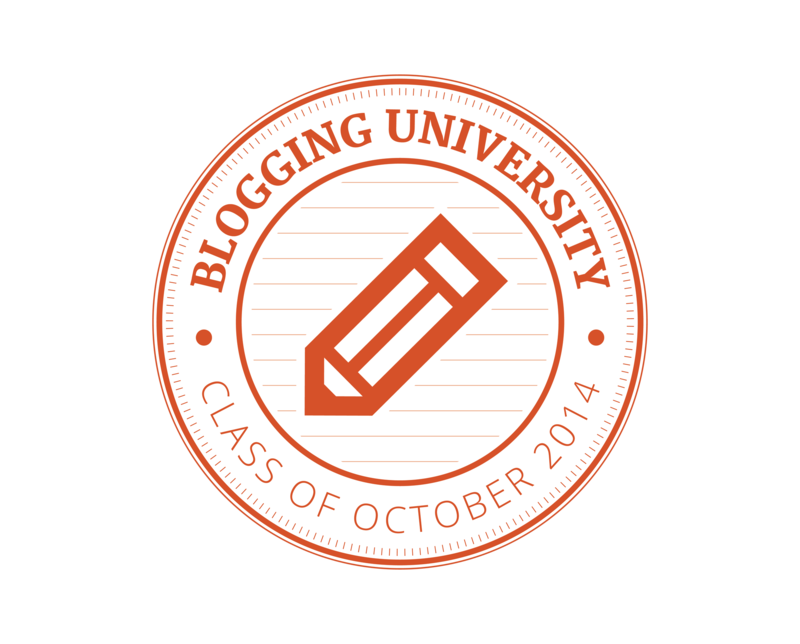 “You have to use social media. You have to come at them in multiple avenues,” Collins said. The Haley VA has a Facebook page, a Twitter account, a Youtube channel and Collins routinely posts photos on Flickr. But there are other issues at work too. Capturing the attention of women veterans is one of the biggest challenges for Pam Smith-Beatty, the women’s program manager at Haley. National statistics show that women make up 15 percent of active-duty and 18 percent of the Guard and Reserves but only 6 percent of the VA population. “We’re finding that for the OEF/OIF/OND veterans, they’re actually doing a good job at capturing them. About 68% of those veterans are actually using the VA,” Smith-Beatty said. Yet overall, she said the VA is serving only about 40 percent of eligible women veterans. “So how do you get the other 60 percent? We look at any kind of recognition event,” Smith-Beatty said. She started up educational sessions every other month called Pink Bag Lunch and Learns. Only 17 attended the first Pink Bag event, but as many as 120 have attended. So Smith-Beatty offered some advice to the Sarasota chapter of the DAV. “If you only get 15 people, then be happy because you’re reaching that 15 people,” Smith-Beatty said. You can listen to the story on WUSF 89.7 FM Public Radio. Do you want to learn more about veteran benefits or are you curious about adaptive sports? If you can ask your question in 140 characters or less, tweet it to #VetQ on Twitter. The new social media campaign is a collaborative effort between the Department of Veterans Affairs and seven Veteran Service Organizations which includes Paralyzed Veterans of America. The hashtag – #VetQ – will identify the question and allow the VA and partner organizations to answer it and promote their services. The idea is that more than one of the veteran service organizations will answer questions giving veterans a range of possible answers for their individual needs. The VA digital team said over time, common questions and answers will likely be categorized on a frequently asked questions page. The other VSOs collaborating on #VetQ are Veterans of Foreign Wars, Disabled American Veterans, the Home Depot Foundation, Student Veterans of America, Team Red, White & Blue, and the American Legion. 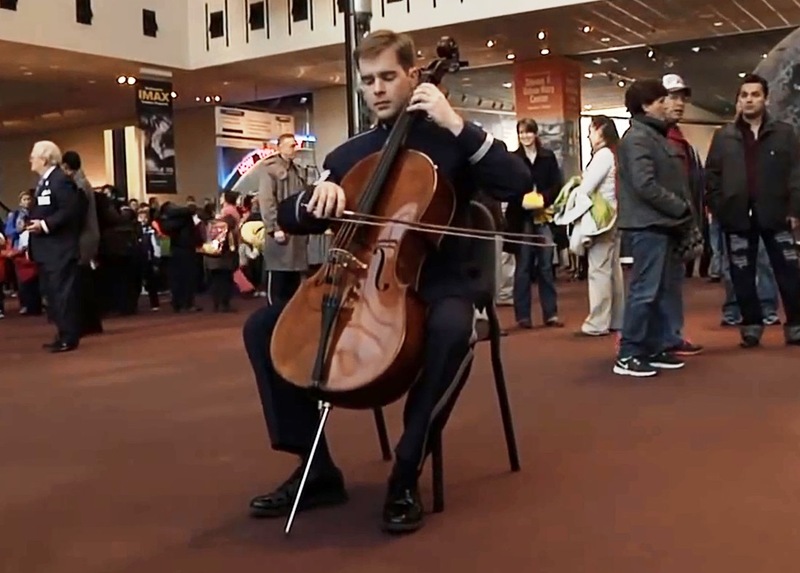 The cellist kicks off the concert by the U.S. Air Force Band Holiday Flash Mob at the National Air and Space Museum. Okay, I’ll be the first to admit the “Bah! Humbug!” came out in me when I saw my first Christmas decorations at a retail store two weeks before Halloween. It’s kind of hard to “get in the spirit” when that “holidays” are commercially “in your face” for months at a time. But, my joy of the season is restored thanks to the U.S. Air Force Band. I wasn’t there for their Holiday Flash Mob concert at the National Air and Space Museum. Luckily, someone shot a video and put it on You Tube. It’s worth the six minutes to watch. especially if you’re a little jaded by all the “holiday shopping” messages over the Thanksgiving Day weekend. I can’t think of a better present to share than the joy of music. And I will admit, the fact that the Flash Mob started with a cello (my favorite instrument) certainly added to my new found happiness. Yet, what is truly mesmerizing are the photos of the children’s faces and even the adults as they watch the concert unfold. Give it a watch. There’s still time to vote in the 2013 American Humane Association’s annual “Hero Dog” competition. I confess. I have a bias in the military dog category for Honza “Bear.” I fell in love with Honza and his story the first time I read about him on Kevin Hanrahan’s blog which was long before the Labrador was up for this award. 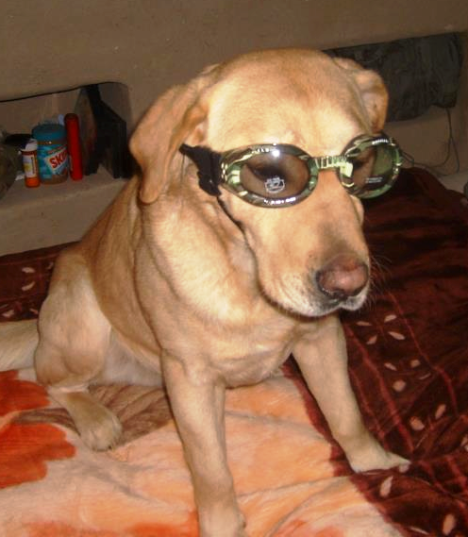 If you need incentive, know that Honza completed over 250 combat missions in Afghanistan with 14 confirmed finds of explosives weighing over 400lbs.He is credited with saving the life of his handler and many others numerous times. But, Honza didn’t stop there. If he wasn’t taking the lead on combat missions, he was visiting wounded troops and lifting morale among all the soldiers. Moments after receiving the Bronze Star, SGT Nolan knelt down and pinned the medal on Honza. 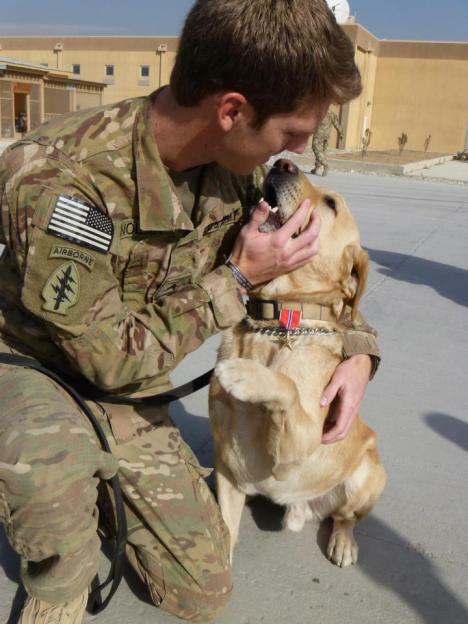 You can vote for Honaz “Bear” to be the 2013 Military Hero Dog here. U.S. Army Sergeant John Nolan told me a great story. When he received his bronze star right before redeploying from Afghanistan he ripped it off his own chest and placed it on his military working dog, Specialized Search Dog Honza “Bear”. He told me that Honza Bear had done all the work, he’s the one that found all those Improvised Explosives…….Honza Bear is the reason John Nolan and many of the Green Beret Team members are alive today. Since military working dogs cannot receive military awards, Hanrahan and Nolan hope Honza Bear will receive the American Humane Society Hero Dog Award.